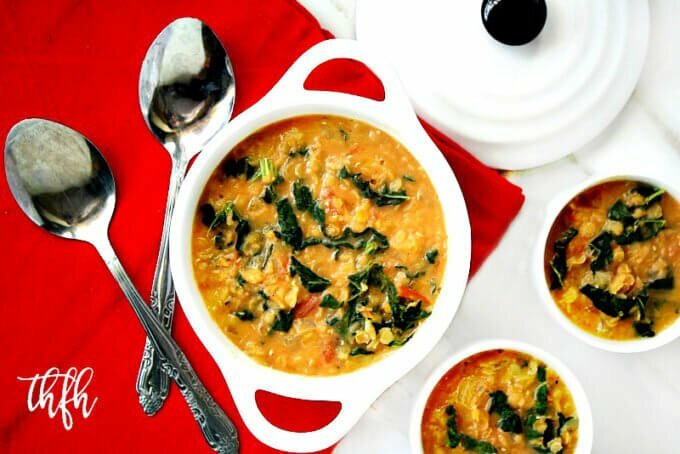 This Creamy Vegan Red Lentil and Kale Soup is a one-pot meal that can be made in about 30 minutes and an extra bonus – it’s freezer-friendly too! I’m a big fan of making hearty vegan soups and some of my favorite are Vegan Cream of Asparagus Soup, Creamy Vegan Tomato Basil Soup, Vegan Stuffed Pepper Soup and Spicy Chickpea and Tomato Soup or my Creamy Vegan Vegetable Minestrone Soup. I’ve been making this Creamy Vegan Red Lentil and Kale Soup for a while now, and it’s taken me a long time to get it to where I could finally say…perfect! Normally when I make it, it has a broth-type of gravy and it was “ok” and everyone ate it, but I just wasn’t feeling it. It needed something else to make it creamy and give it some depth. So I added a can of full-fat coconut milk and it transformed it into a creamy, bisque-type soup. It gives it just a tiny hint of coconut flavor and a beautiful light orange color that is only intensified after adding the kale. And, if you don’t have kale on hand, I’ve even made it with chopped organic baby spinach and it’s really good too. This is also a very budget-friendly meal because you can buy organic red lentils right around $4.00 a pound, organic vegetable broth around 0.20 cents/ounce, canned organic coconut milk around 0.15 cents/ounce and you probably have everything else on hand to make it. You can feel good about making this recipe for your family because it’s organic, vegan, gluten-free, dairy-free and nut-free. Want even more healthy soup recipes? Check out Vegan Spicy Roasted Red Pepper and Garlic Soup, Raw Vegan Cream of Mushroom Soup, Vegan Black Bean Soup or my Clean Eating Cookbook with an entire chapter of 20 meal and entree recipes you will love! Tip #1: I used both fresh organic roma tomatoes and also organic diced tomatoes in a BPA-free can and also organic diced tomatoes in a glass container. Any type of tomato will work, just make sure you have approximately 2 cups. For the tomato sauce, I like to use an organic tomato paste in a BPA-free can. Tip #2: Make sure you use a can of “full-fat” coconut milk because that is what will make it extra creamy. I don’t think boxed or homemade coconut milk would give it the same texture. Tip #3: Feel free to adjust the amount of cumin, Himalayan pink salt and cayenne pepper to your taste. Tip #4: I’ve used both curly kale and lacinato kale and both work fine. If you don’t have kale on hand, chopped organic baby spinach works perfectly too. Or you can even leave the leafy greens out all together, but they do add extra nutrients to the meal. Prepare the veggies: Dice the onions and tomatoes; de-stem the kale and chop into small strips. Add all ingredients for the soup to a medium sized pot, stir together well and bring to a boil. Reduce the heat to simmer (low/medium heat), cover and cook for 20-30 minutes, or until the lentils are soft. Stir occasionally to prevent burning and add a little more veggie broth if needed. 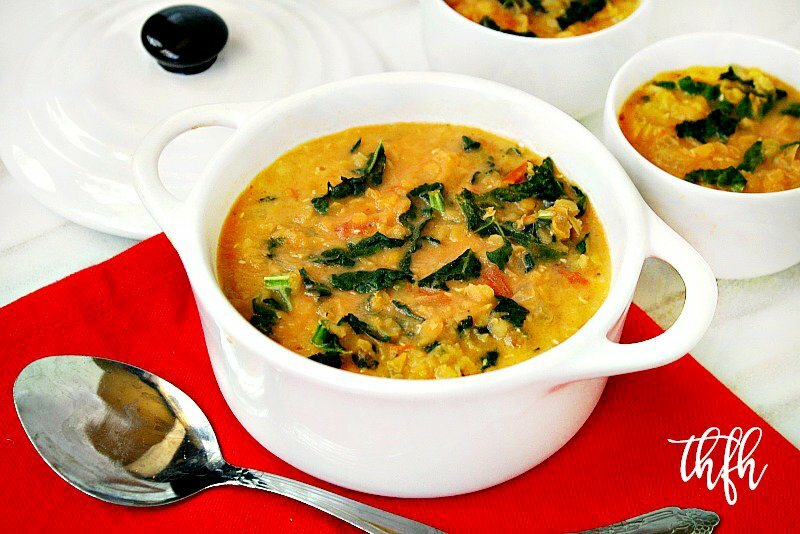 Once the lentils are soft, remove from heat and add the chopped kale and entire can of coconut milk. Stir to make sure everything is well combined. Adjust seasonings to your preference. The recipe and photographs for "Creamy Vegan Red Lentil and Kale Soup" by Karielyn Tillman of The Healthy Family and Home website are licensed under a Creative Commons Attribution Non-Commercial No Derivatives 4.0 International License and cannot be used without my written permission. Hi! Thanks for this recipe. I made it last night, only with canned diced tomatoes (I used two 14oz cans) and about 1/3c coconut cream instead of the can of coconut milk because that’s what I had on hand. It was SO good! I had the pigeon pea lentils, so they did take longer to cook, but I really appreciated that they didn’t go to mush. My standard/favorite lentil soup is a sweet potato curry lentil (served with yogurt and toasted coconut chips) and the standard red lentil I buy at the store usually get very mushy. Hi there Abigail! I’m so glad to hear you enjoyed it…and thanks for sharing your adaptations. I’ve also substituted organic BPA-free canned tomatoes sometimes when I didn’t have fresh tomatoes on hand and they work just fine. This recipe is really good. I’ve made it twice now. It’s an unusual flavor profile, but in a good way. I like to dial back the the coconut cream to 2/3 of a can and also add a little Siracha. My husband likes this recipe a lot too. Hi there CJ! I’m so glad to hear you enjoyed the recipe and ~love~ the addition of Siracha…what a great idea! Hi there Cassie! The answer is YES! YES! and YES! I do it all the time and it so convenient to have a quick meal ready in minutes. It’s the perfect make ahead dinner and very freezer-friendly. This was delicious!!! I doubled the recipe, but only used one can of coconut milk. I added chopped baby oortabella mushrooms in with the main ingredients. I also used canned diced tomatoes (no salt added) since I had that laying around. Super hearty and filling! Hi there Andrea! I’m so glad to hear that you enjoyed the recipe and -love- the addition of mushrooms!! That was a great idea to make a double batch because it freezes and reheats really well. Hi! Just came across this recipe and wanted to make it for my next few days worth of lunches! I’m in a time crunch at this moment, would throwing everything in the crockpot still work? I hope so! (And if so, how long would you say?) I’m always on the go and it would be so much easier being able to leave for a few hours lol! Thanks! Hi there Amber! I’ve never tried it in a crock pot before but I don’t see why it wouldn’t work. I would definitely put it on the lowest setting because I only takes about 20 – 30 minutes for them to cook on the stove so I wouldn’t put them on high or for a very long time because it might overcook them. One thing I do to save time is sometimes in the morning I will prep the veggies (onions, tomatoes, garlic) and have all those ready to go. Then at dinnertime all I have to do is throw everything into a pot and let it simmer on low/med heat for about 20 – 30 minutes and I stop to stir it a few times. I have recently started eating clean, limiting/eliminating processed foods, gluten and dairy. I am getting ready to make this. It looks amazing! Can I freeze any leftovers? Hi there Misty! Congratulations for making the changes to healthier, clean eating! And, you will find all the types of recipes you are looking for on my website too! To be honest, as many times as I’ve made this, we have never had leftovers lol! I’ve never tried freezing it but I don’t see why it would be a problem. The soup has a creamed/mashed lentil type consistency and may need a little extra liquid (veggie broth, water, coconut milk, etc) to thin it out once you reheat it. We just had this delicious soup for dinner. I added garlic (because I simply can’t cook without it). I also used lite coconut milk and only used a half can. This has definitely earned a spot in our family’s regular meal rotation! Hi there Char! I’m so glad to hear you enjoyed it! And it’s funny you mention the garlic…now that I make it from memory because I’ve made it so many times, I often stop and think ‘did I forget the garlic?” because I, too, ~always~ add garlic to practically everything. But when I first started making it, I never added it and it tasted so good without it I didn’t want to mess up a good thing lol! Hi there Dianne! I’m so glad to hear you liked it! Hi there Ella! Yes, that should work, as coconut milk is normally the dairy-free substitute for evaporated milk. If you didn’t need it to be vegan, you could also try heavy whipping cream if you’d prefer that instead. Just finished eating 2 portions each of this delicious, creamy soup. Only adjustments, we cooked the kale a little longer (our kale is currently a bit woody and we wanted to be sure it was soft) and dressed with the live of half a lime. Absolutely perfect, thank you! Hi there Rob! I’m so glad to hear you enjoyed the soup and I love the addition of lime you added! Thanks a lot for the great recipe! I used spinach instead of kale (don’t like the taste) and ad some curry (love the taste ;-)) and there was a little cauliflower in the fridge: Taste great with this soup! I reduced the cooking time to round about 20 Minutes because after this time everything was ready :-D. I made enough for two days and the next day it was even better! A great recipe to improvise. Love it! Hi there Claudia! I’m so glad to hear you enjoyed the recipe and love the substitutions you made…especially the spinach! Hi there Lauren! I am so glad to hear that everyone loved it…especially your husband! I just made this and HOLY COW … it is divine! I used tomato paste (that’s all I had, and it thickened it up) and light coconut milk. I followed the rest of the recipe exactly. It is phenomenal, but next time I’ll need to double it. Thank you! Hi Deb! I’m so excited to hear you liked it and were able to make the substitutions work! Hi, i just made this and not sure if i did it right. It was thock before the cocunut milk. The lentil basically disimtergrated. Is that supposed to happen? I left it about 30 min after boiling. Hi there Priscilla! Yes, it sound like you did everything correctly! The lentils will become very soft and mushy. They will not be solid like a red bean or black-eye pea is in a soup. Make sure after they initially come to a boil, to reduce the heat to low/med and cover the pot to simmer for the remaining time. You wouldn’t want to boil them at high heat the entire cooking time. Lentils don’t take very long to cook but if you don’t want them that mushy, you could cook them for less time. Just keep an eye on them and remove them from heat just as they become soft, or get to the texture you like. 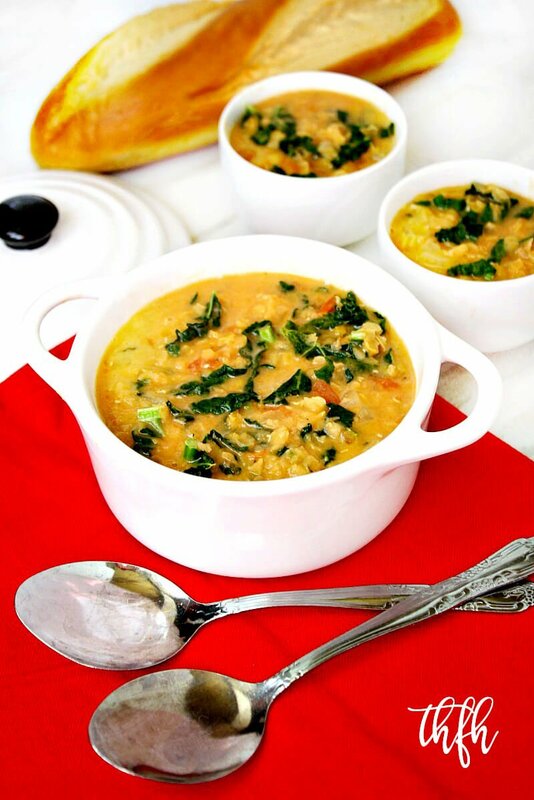 This recipe looks delicious – I love red lentil soups and I can’t wait to try it. One question, I am thinking about bringing this to a work “lunch bunch” event where I need to provide ~15-20 servings. How much would you say your current recipe makes in terms of servings? Thanks!!! Hi there Linsey! The recipe will make approximately 4 servings (I usually serve my husband an extra large serving, my two boys a smaller serving each and we have another small serving left over). The good thing is that this recipe would be really easy to make in a larger batch. I would use one of those big soup/gumbo pots so it would fit. It would also be a low-cost meal to make in a large batch too. I just made this recipe. It came out delicious. I just added some fresh ginger and turmeric to it for this is my obsession. Hi there Berenice! I’m so glad to hear you enjoyed it and ~love~ the additions you made to it! Ginger and turmeric are my favorites too and I’ve never thought to add them in…I’ll have to try that next time! Thanks so much for posting this recipe !! Hi there Yvonne! I’m so glad to hear you enjoyed it! To be honest, we never have any left over when I make it so I’ve never tasted it cooled off lol! but that’s good to know! Can’t believe how simple this is. I’ll be making this for the 3rd or 4th time tonight. The whole family loves it – even the littlest kiddo. I’ve actually made it back to back two days in a row before…it’s so easy to make! I love your website – one feature I wish your recipes had was an approximate serving size. I always have to guess if I need to double or triple your recipes to feed my family of 6. But we always love what you share with us – thanks for all the tasty ideas! After I started making recipes for my new cookbook, I’ve been adding the approximate serving sizes to the recipes. I’ve also been doing that my newer ones I’ve been posting (mostly from this year) and have even been going back to some of the older ones and updating them. However, this one is a newer recipe so I’m not sure why I missed it on this one. Absolutely delicious! !one of the best recipes I’ve tried for stews!!! Thank you! Hi there Jana! I’m so glad to hear you enjoyed it! This may seem like a silly question, but do all the different color lentils have different tastes as well? I’ve only ever used the greenish/brown colored lentils. I wouldn’t use that one for this soup because I imagine it’ll look ugly. Hi there! Don’t worry…your question isn’t silly at all! In fact, I am partial to red lentils…I think because I love the color! That’s really the only variety I buy, so I wouldn’t be an expert on lentils. Every single one that we use in Indian cooking – and we use a lot – has a distinct taste and can rarely be substituted for another in a specific dish. Here is a quick primer of the major ones. I have given the common Hindi name for each in parentheses. – Pigeon Peas – (Arahar or Toor Dal) – takes a while to cook. Most widely used. – Moong Beans – (Moong Da) – Comes in a green and yellow and and whole and split in each. The whole ones take longer to cook. and each of taste distinctly different. These are the major ones. I do understand the some of them can taste similar if they are heavily spiced. To make this with lower sodium, can I use half broth and half water? Hi there Marissa! Yes, you could adjust the amount of broth and also reduce the amount of Himalayan pink salt in the recipe, you may just have to adjust some of the other seasonings to compensate. Another suggestion would be to use “low sodium” vegetable broth (which is what I use) and “no salt added” tomato sauce (which is what I also use). However, even the “low sodium” vegetable broth has 140 mg of sodium in (1) cup and the “no salt added” tomato sauce had 15 mg of sodium in 1/2 cup. It doesn’t sound like a lot, but if you have to watch your sodium intake, it’s a big deal. When I make meals for my father, who has to limit and watch his sodium intake very closely, I have to either omit salt altogether, reduce it significantly or find other ways to season the dish. So I know every little bit adds up…and matters! I may or may not have made this for dinner every night for two weeks in a row… its that good! The second time I added sweet potato and served it with some oven roasted garlicky broccoli. SO tasty! Thanks again! Hi there Jess! I’m so glad to know that you like it as much I do….I think I made it twice it one week too lol! It’s so easy to make with simple ingredients, it’s hard to pass it up. Hi there Marcia! Welcome and thanks so much…I really appreciate it! another wonderful recipe! followed to a t. perfect!!!! Hi there Usnea! Thank you and I’m so glad to hear you enjoyed it! I just made this for dinner and it’s AMAZING! I’m a beginner at making soups so I loved how simple the directions were. I also substituted the tomatoes for a can of diced tomatoes and it worked perfectly. I love finding inexpensive and delicious recipes like this one, especially since it was so hearty and perfect for winter. Thanks so much for sharing!! Hi there Jess! I am so glad to hear that you enjoyed the soup! You and I are just alike in that we both like easy recipes…I like to keep it simple! Holy moly. This was good. I’m doing a series on my blog called “Try Something Sundays” and this Sunday it’s LENTILS! I plan to feature a version of this delicious and simple recipe. I will link it back to you as well. Thanks for the post! Hi there Becky! I’m so glad to hear that you enjoyed the soup! I just made this and it is delish!!!! I used a can of diced tomatoes instead of fresh and omited the sauce. So good!! Thanks for the recipe!! Hi there Sue! I’m glad to hear that you enjoyed the soup and that the substitutions worked well! I don’t have red lentils available where I live. Can I use the yellow/golden lentils instead? Or would this change the taste? Hi there Nicole! Although I haven’t tried it, I think the yellow/golden lentils would work perfectly and shouldn’t change the taste. If I didn’t have red lentils on hand, that’s what I would choose to use as a substitute. This looks ridiculously good! It would be perfect during this super cold weather we’ve been having =) Thank you for sharing. Hi there Lauren! Yes, indeed..it is perfect for this crazy cold weather, especially this past week! I just made a pot of the lentil soup. It was so yummy! I omitted the tomatoes and tomato paste, and instead I added diced carrots and sweet potatoes. I cannot have the spices right now as well, so I ate it without, and it was good even then! I spiced a bowl for my husband to have, but I used Sea Salt, pepper, ginger and Mrs. Dash herb blend, instead of the listed spices, and he said it was really good. I’ll have to try it as it’s written sometime, but I definitely enjoyed it with the few small changes to accommodate my restrictions. Hi Annmarie! What great news! I’m so glad the substitutions worked and that you got to enjoy it. And the carrots and sweet potatoes were a great idea. I was in the mood for soup today and made this; wow! It is delicious! I love red lentil based soups and this is my new favorite! Thank you for this recipe! It’s the perfect healthy comfort food dish on a cold, Winter day like today. I will definitely be making it again. Hi there Racine! I’m so glad to hear you enjoyed it! And you are right…it is just perfect for a cold weather day! Could the coconut milk be substituted for something else dairy free? Hi there Courtney! This is the first time (of the many times I’ve made this) that I added canned coconut milk so I haven’t really experimented with anything else yet. When I wanted to make it creamier, the first thing that came to mind was the canned coconut milk, because it is so think and has a fairly neutral taste. You could try it with boxed/homemade coconut milk, almond milk or your favorite non-dairy milk in the same amount (about 13.5 ounces) and it should add some creaminess to it but the sauce may not be as thick as with the canned coconut. I would definitely try it though. If I didn’t have canned coconut milk on hand, I would have probably used on of the non-dairy milks listed above. Hi there Shanna! I’m extra happy when I hear one of my recipes are husband approved…especially since mine can be a little picky at times lol! I just made this soup and it is wonderful!The coconut milk brings all the flavors together.Thanks! Hi there Rosemary! I so glad to hear that you enjoyed the recipe! I agree with you too about the coconut milk…it ~definitely~ makes all the difference. I can’t believe I made this for so long without it but I will never go back now lol! I just made lentil soup, but mine is golden lentil, but your version sounds delish, especially when kale is involved. I pinned yours. Hi there Madonna! I’ve never tried golden lentil but it sounds really good. I will look for some next time I buy more lentils for a little variety. And I also love the added kale too! PS- I was thinking of adding sweet potato. Would you recommend adding this at the same time as the veggies or a little later? Hi Annmarie! I would add the peeled/diced sweet potatoes at the same time as you add everything else in the recipe (except the coconut milk and chopped kale) because it will take approximately 20 – 30 minutes for them to get soft. Use the sweet potatoes as a guide of when to remove them from heat instead of the lentils because the lentils will not take as long to cook. Also, just keep an eye on your liquids..if the sweet potatoes start to absorb some of your liquids, just add a little more vegetable broth, but not too much because you will be adding an entire can of coconut milk at the end. It’s a really easy recipe and hard to mess up, so just make adjustments as you go until you get it to the consistency you like. I was so glad to see this red lentil soup recipe. I have had a bag of lentils in my cupboard for quite a while now and have been wanting to try my hand at a lentil soup. I’d like to try this recipe, but I cannot eat tomatoes/tomato sauce at this time. I’m assuming I can just leave out these ingredients, or is there a replacement for these that you would recommend? Thanks, and I look forward to trying this recipe. Hi there Annmarie! I’m glad you found a recipe to make with your red lentils! You could definitely leave out the tomato sauce…it is such a small amount and I only added it to give the vegetable broth a little more flavor. For the tomatoes, since it is around 2 cups worth, I would try to find a substitute to give your soup some more “bulk”, since the lentils are so tiny and end up kind of mushy. I ~really~ like your idea of using sweet potatoes and think that would be perfect! I actually have another soup-type recipe in queue to post and it has sweet potatoes in it, so I know they will do well in a soup.